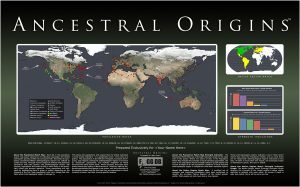 The Ancestral Origins Test will help you discover your GeoGenetic links with populations from around the world with results shown on an easy-to-read full colour map with 10-page report. 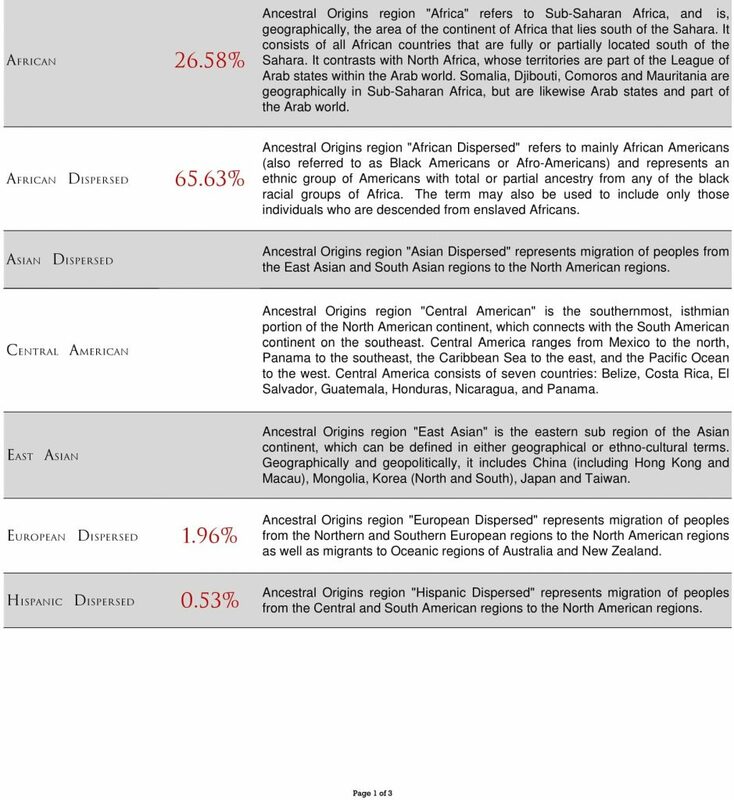 The Ancestral Origins Test will help you discover your GeoGenetic links with populations from around the world. Ancestral Origins is the most straightforward and easy to understand ancestry DNA test on the market. Your 24 marker DNA profile is compared against hundreds of global populations and 14 anthropological regions whose collective genetic information is known and scientifically validated. The cost of our Ancestral Origins Test is £149 and your results map and supporting 10-page report will be available to you in just 2 weeks from the receipt of DNA samples at the laboratory. Ancestry DNA testing is a truly rewarding experience, sometimes providing very unexpected results – perfect if you are looking to put together a unique genealogical record for yourself and your children. We will identify how strongly your DNA matches studied populations. Your results will include a map with coloured symbols indicated how strong or weak your association with a certain area is when compared to our database. Results will show how closely your DNA matches studied anthropological regions. You will be able to see where in the world you have the strongest matches and can estimate the location of your ancestral origins. It will be possible to tell where you come from by the colours on the high-resolution map we provide with your results. Follow the journeys your ancestor made out of the African continent and to the rest of the world thanks to the colour coded map that we provide. How to interpret the map will be explained in depth in the 10-page colour report that comes with your results. Each Ancestral Origins DNA Ancestry map is professionally printed using a photographic-quality five-dye printing process on matt photographic paper. This process produces rich and beautiful images that are suitable for framing and displaying with pride in your home. The ancestry maps are available in two sizes. The Standard (A3 297mm x 420mm / 11.69” x 16.54”) version, or a stunning Extra Large (A2 420mm x 594mm / 16.54” x 23.39”) version which is available for an additional £15. 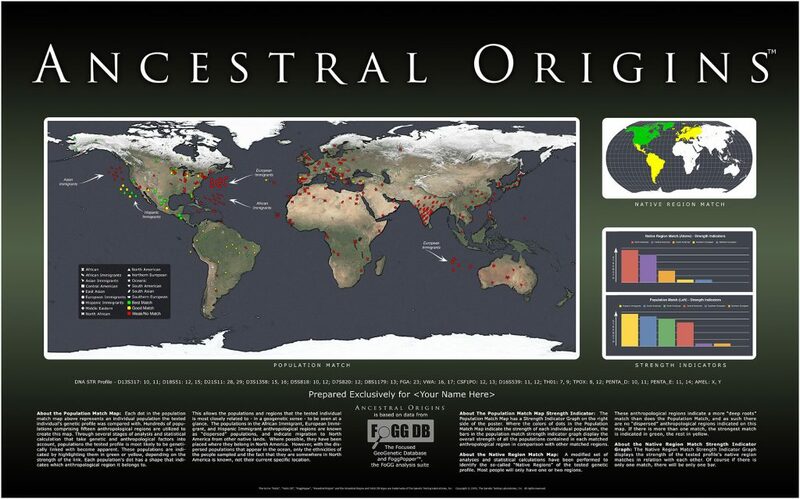 Every Ancestral Origins map is custom made and your own personal map will have “Exclusively prepared for” followed by your name printed on it. Please click on the sample map above to see an example. The legacy of your ancestors is in your DNA. You inherited certain DNA sequences in your genetic makeup from your ancestors – these sequences have been passed down for thousands of years and inherited by you today. These special sequences have been studied and linked to certain parts of the world and specific populations. The laboratory has access to a vast database containing the DNA sequences of most of the world populations that have been discovered and studied. When we analyse your DNA sample, we will run it against the populations in our database to find matches. Find out even more about your ancestry with the Ancestral Discovery upgrade. For an additional £30 you will receive a full colour pie-chart showing your genetic breakdown by percentage together with a 3-page report detailing your genetic breakdown and database matches by region. Need to talk to an expert? 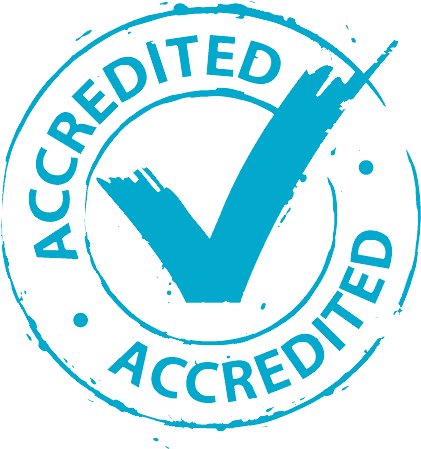 Our test results are easy to follow but contain a lot of information. If you wish to talk to someone, we have a professional ancestry test consultant at hand to answer all your questions and take you through your results to help you piece your genetic puzzle together. If ordered at the same time as sending your samples, the advanced purchase price per consultation session is £65. If ordered after you receive your map, the service is available for £75 per session. 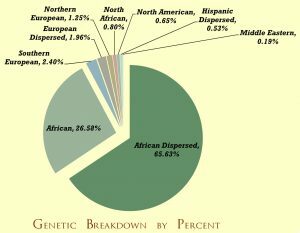 Q: How does this test differ from those offered by Ancestry.com and similar companies? 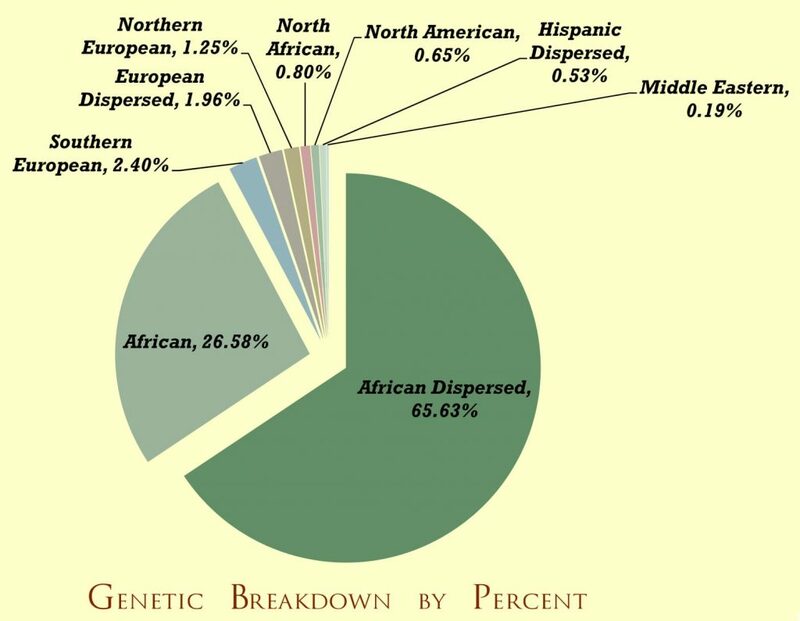 A: The Ancestral Origins test is a STR-based test, which provides exact genetic matches to population groups, while the Ancestry.com and similar tests are SNP-based tests, which provide estimates of ethnic percentages. Q: What can I use the information I gain from this test for? A: The purpose of the Ancestral Origins test is to pinpoint population groups for additional research. For example, learning your genetic ancestry is strong in France and Italy today helps direct your research into those countries or related regions. In addition, this test provides your genetic profile, which can be used for identification and relationship analysis, as well as future genetic testing. 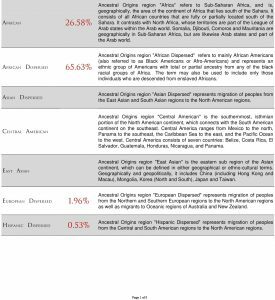 Our Ancestral Origins Test is one great tool you can use for your DNA ancestry research. It reports the ancestry from both your paternal and maternal sides but cannot distinguish between them. If you wish to specifically trace your paternal origins, we recommend our Paternal Lineage DNA Ancestry Test whilst if you wish to delve deeper into your maternal ancestry we suggest our Maternal Lineage DNA Ancestry Test.